Nissan Motor Co., Ltd., and Sumitomo Corp. announced joint plans to initiate a business venture to "Reuse, Resell, Refabricate and Recycle" lithium-ion batteries previously used in electric cars. 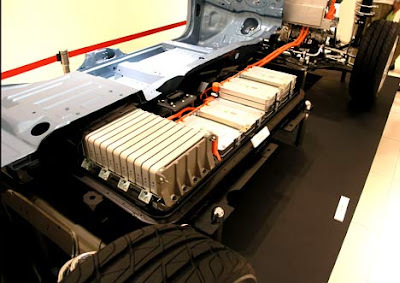 The "4R" business model is designed to capitalize on the supply of reusable lithium-ion batteries as electric cars achieve widespread marketplace acceptance. While today there is no existing supply of large-capacity reusable batteries, by 2020 in Japan, the demand for "second-life" batteries is expected to reach the equivalent of 50,000 electric-cars per year at the minimum, as demand grows for an increasing range of energy-storage solutions. "We recognize Nissan's unique responsibility as the first company in the world to commit to delivering affordable zero-emission mobility," said Toshiyuki Shiga, Nissan’s COO. "Consumers are excited by the promise of all-electric, zero-emission cars, but they also want assurances that lithium-ion batteries can be reused and recycled. In fact, our batteries are not only reusable, but they also contribute as a solution to energy storage. We are pleased to have found a business partner in Sumitomo." "As a company that handles initiatives from natural resources and battery materials to building an infrastructure for electric vehicles, we are quite pleased to announce our work with Nissan to create a new market with second-life batteries," said Kazuo Ohmori, Sumitomo Corp.’s executive VP. "In coming years, our social commitment is to contribute to the substantial reduction of carbon dioxide. I believe this new potential venture could help us fulfill our social commitment." The two companies have committed to a joint feasibility study to establish a framework for a JV company, which is expected to be operational by late next year, in Japan and the United States. In Europe, Nissan will proceed to explore the 4R business model with its Alliance partner, Renault. A task force from Sumitomo and Nissan will work to finalize details such as the shareholding structure, capital investment, business structure and other operational concerns for the joint venture.